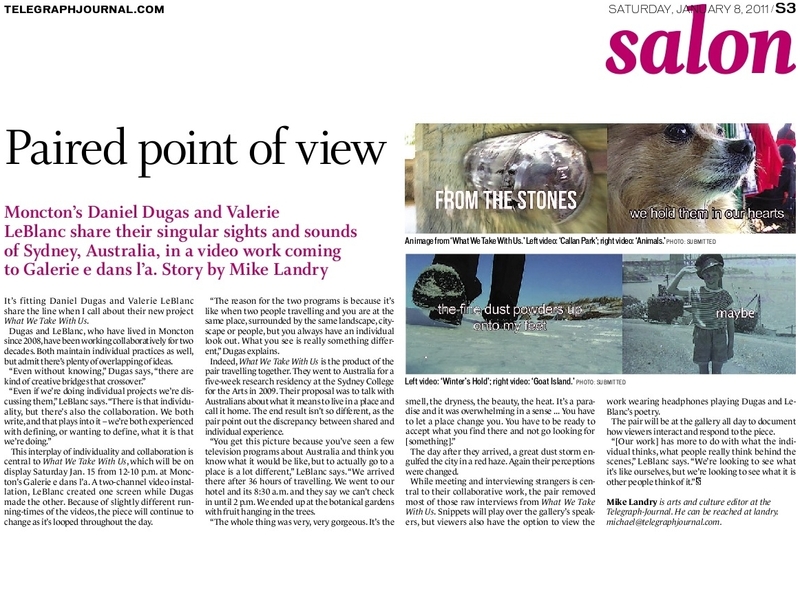 Browsing articles in "What We Take With Us"
The following are transcripts of the talks Valerie LeBlanc and I gave at The New Gallery on January 5th 2012 during the opening of our video installation What We Take With Us. Thank you to: everyone at the New Gallery who worked to bring us here and to Tim and Jessica for smoothing out crimps during the actual installation of WHAT WE TAKE WITH US. Special thanks to Tomas Jonsson, Kathryn Blair and John Snow House Director, Shara Rosko. For any artist, starting a new year, exhibiting an artwork is the best possible scenario. The chance to visit Calgary is amazing. It puts me on the spot, to not only say what I have been doing, but also to evaluate what I have done since leaving the city in 2008. The chance to show this work in Calgary seems so appropriate as Daniel and I continue to think of Calgary as our second home. But more than that, the initial planning for the installation began in Calgary, early in 2007 while applying to the University of Sydney to carry out the residency. 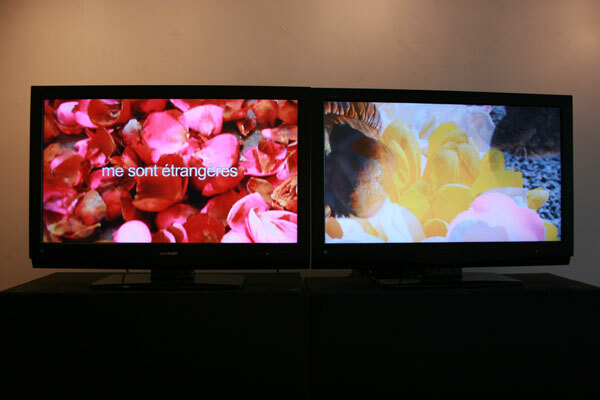 Another version of the installation was shown – for one day only, in January 2011 at the Galerie E Dans L’A, in Moncton, New Brunswick where we currently live. So presenting at The New Gallery completes a cycle of intentions embodied in this work. Sometimes it seems as if living is about managing points – not the points that have synched with all monetary transactions – but those emergency points that drive us from event to event. WHAT WE TAKE WITH US wants to step back from the edge to place value. When I first entered the art world, deconstruction was big. Anecdotes were frowned upon. 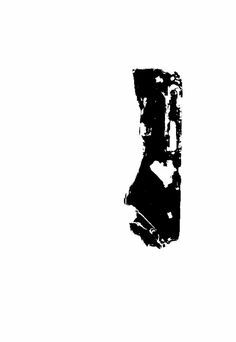 In the classroom and gallery, if storytelling was an employed methodology, it was required to appear only in the most pure, most elemental of symbols. And yet the idea that everything moves in circles – and that there is nothing new under the sun was also brought forward. We are fortunate to live and work in a time period when visual and audio collage, in all of its forms has place – and that the specific arrangement of elements, with emphasis on time and space are valued. Since access to digital tools became both available and affordable to artists and consumers, it facilitated possibilities for creation, communication and for description. As we are well aware, these same tools are utilized in the constant bombardment of marketing. That presents a complication of finding meaning in creation that dwells within or moves beyond product placement. In the immersive environment, we are challenged to captivate imagination, or to lay out elements that offer / share inner experience. This project was based upon travel, personal exploration of specific geographies but also upon meeting people, chance conversations, and interviews. In the making of the videos and the creation of a format, it was important for each of us to move past the first level of the experience, to allow events to distil over time through memory and impact. Through the process of building something in time based art; having a cut and paste-able timeline similar to our own ideas of memory and its very complicated architecture, is modern magic. If memory is a string of events (pearls) stretched out over time, then creating videos or any artwork can be a way of re-stringing the whole poetry of it. It would seem that an artwork should always exist between reality and dream / influences and changes that become absorbed. The video loops projected onto the walls of the gallery, and the soundtracks carried by the corresponding left or right headphones work to create an immersive environment for contemplation. Those soundtracks, texts and visuals are meant to flow and to interact as the projections loop. The ‘open sound’ heard upon entering the space creates another element closer to actual experience of travel and interaction with others. One of the topics that came up in the interviews is reconciling the feelings of attachment you feel for a place when you are now there, and how it reverses when you go back and leave the second home. To speak more generally of my practice, basically, I do 2 things: I create from within, working through thought process and visceral reality; and I ask (interview) others about what they do. In that, the best that I hope for is to bring out other voices, and to create a dialogue. 2011 was a busy and productive year – something I always strive for, unusual in the mix, was the gift of reaction to some projects. In particular, I presented videos in 3 European capitals: DOWNUNDER was curated into the She Devil Exhibition at the MACRO – Museum of Contemporary Art, Rome, Italy. The She Devil screenings ran from June 25, 2011 – January 8, 2012 in the MACRO’s V-Tunnel. On November 4 & 5, I presented The Renovation, at the Ruins in 20th Century Art and Literature Conference at the Senate House in London, England. 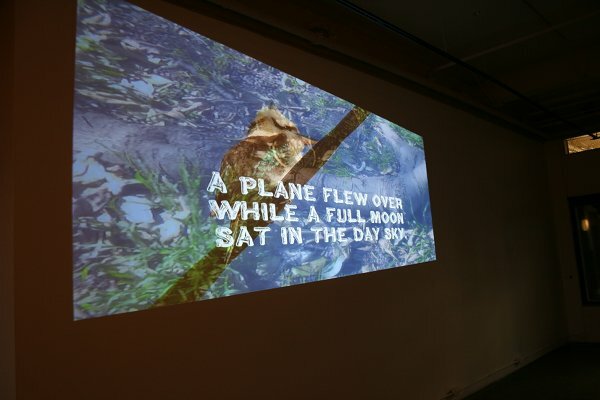 My 2011 video Paper Moon, Cardboard Sky , was screened at the 24th Instants Video at the gallery Le 104, Paris, France. Those 3 presentations rose were facilitated through Internet connections. What we have seen demonstrated so well with the Internet is that individuals and communities are no longer only linked to geography or birthright, or even common history. A sense of belonging can rise from topical common interests and affinities. The reasons for some of those connections might appear obvious by magnitude, and some, although seemingly banal, might ‘hold more water’ than detected in the real time of the moment. As important as visual and sound cues are into positing the space of habitation, writing has become very important for me. Sometimes, it is in a manner of connecting events and thoughts in as orderly a form as an essay. And sometimes it is in arranging those same events and thoughts into poetry using visuals, sound and texts. What We Take With Us takes that form; aiming to float and ground in the memory of connections over time. Audience / participants should be and are – everywhere. Everyone has a voice and wants to be heard. Maybe taking part in what happens in an art gallery creates a necessary pause; that kind of pause that can help us step outside of the daily rush and routine. A new starting point can arrive unexpectedly. Recognizing it can become a refreshing experience, like celebrating the beginning of a new year. In 2012 Valerie LeBlanc will be starting a PhD in the Visual Arts at the University of Sydney in Australia. Also screened in 2011 as part of OIL, EMMEDIA, Calgary, AB July 12, and at the OK.Quoi? !,Contemporary Arts Festival, Sackville, NB July 28. We have all seen this: a house on fire, an apartment burning, in the middle of the night. It could have been a short in the attic, a cigarette in a bed, a curtain too close to a space heater. The firefighters are there. It’s cold; the residents are outside looking at their houses, their rooms burning to the ground. As usual there are journalists reporting on the drama, asking questions, trying to figure out what happened. Some people step forward and brave the spot light. They have blankets on their shoulders; they look exhausted, fragile as they speak to the rapidity of the fire, the thickness of the smoke. As the camera pans onto the charred remains, it becomes obvious to everyone watching that some tenants were lucky to get out in time. But at the end of the interviews, many of the residents come to the sad conclusion that the photo albums; the memories of a lifetime, did not make it. There is a pause; most break down at the thought of the disappearing images. In our visual society or ‘optical civilization’ as Paul Virilio likes to call it, the photo albums, analogue and digital, have transcended their mnemonic status, they have become life itself. They are what we can and cannot remember. In 1979, at 18 years old, I hitchhiked across Canada and the USA. I decided not to bring a camera because I thought that taking pictures might interfere with my ability to remember events. In New Mexico I got a ride with an ex Korean War veteran who was also an ex Hells’ Angel. As we crossed the border between New Mexico and Texas I made the mistake of commenting on the beauty of the sky and the sunset. He said that I should take a photograph. I told him that I did not have a camera and he became quite agitated. When we arrived in Amarillo, in the panhandle of Texas, we stopped for a beer. As I sat at the counter, my driver excused himself to go to the restroom. I drank my beer, waited a while. Eventually I realized that he was gone with my backpack. At that moment, his flash of anger became clear to me. He was planning to steal my stuff and the loot was definitely lessened by the absence of a camera. Obviously I survived and made my way home from what was a real interesting trip. But the absence of physical images, of snapshots, of this wonderful sunset for example, has made room for another kind of narrative; one weaved with invention. A history more saturated if you will. I am a videographer and a poet and I am both at the same time. I don’t see a separation between the two activities. One informs the other in a Ping-Pong way. When I was ten, I found a flat stone and I started what was perhaps my first art project. I drew symbols, scribbled on it; some were like drawings, others like letters. I buried the stone in the woods near my home thinking that archeologists might find it one day. I was thrilled at the idea and could imagine a team of scientists pondering on the origin of this unknown civilization. When I think about it today, I think it’s funny, and it is. It’s funny but it is also ironic and subversive. There is a desire to question the establishment, the world, and the memory of the world as its stand in front and around everything. I recently did a video series called TABLETS , a tongue-in-cheek collection of videos extolling the magical properties of technology. I think that there is a connection between these videos and that buried stone somewhere in Le Bois du Juvénat in Lévis, Québec. What We Take With Us is about points of view, about memory and memories, about what is collected, recollected, juxtaposed and ultimately imagined. It is about image and text, about the relation between text and image, about signs, about perception. It is also a project that took us on a long circle. As Valerie mentioned, in 2009 we were invited to take part in a research residency program at the Sydney College for the Arts in Sydney, Australia. The premise of the project was an exploration of internal and external experiences characteristic to travel and displacement. 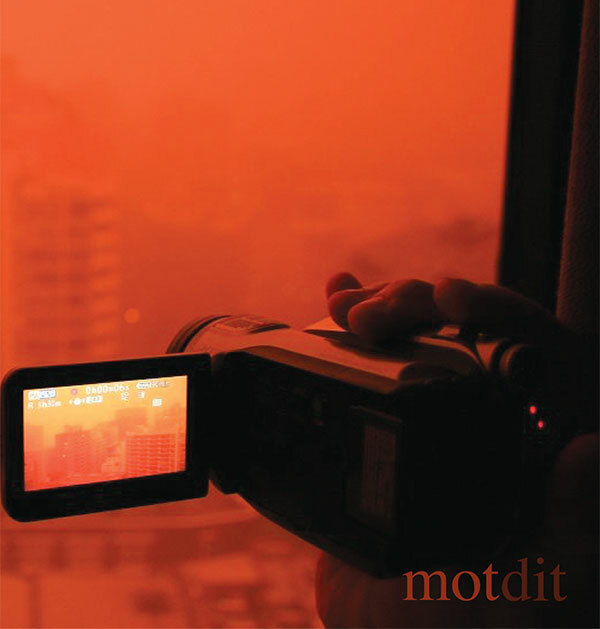 We met and interviewed people, collected images and sounds. Later, it became apparent that each of us had processed the experience of seeing and being differently; with our individual filters. Faced with the same set of circumstances, we were not seeing the same thing, and not reacting the same way. When we came back to Canada and began examining the material, it took six months of sifting for the idea of a two-channel video installation to take shape. We each started to build a distinct program of video-poems to be screened side by side. A funny thing happened, and we realized this only at the end of the creative process. Valerie’s program starts with a piece called SAMOA while my program begins with RED. Even though the programs are looped, these two videos function as metaphorical book ends for the whole project. 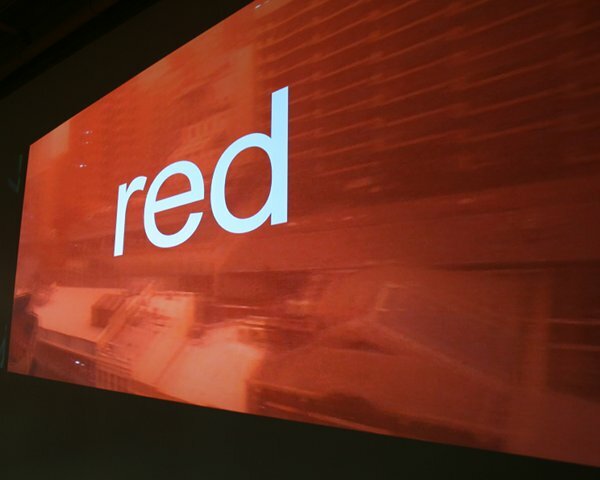 RED is an account of the dust storm  that blew over Sydney a few days after our arrival on September 23. SAMOA, on the other end of the shelf, is a video that was inspired by the earthquake and the tsunami that rocked the Samoan Islands on September 29. After the disaster, many islanders came through Australia to visit with family members. On the day of our departure, at the airport, October 22, a group of Samoans was going back home. Valerie noticed the gathering and stopped to listen to the singing. I was already past the gate and did not witness the scene. We have worked together for 20 years, on different types of collaborative projects, while also carrying out individual practices. The degree of collaboration often changes depending on the nature of the project. Some are totally fused and others, as with What We Take With Us, are hybrids; comprised of discrete elements. One of our longest collaborative endeavors is probably a Dictionary of Definitions, we have been working on it since 1990 and it is still a work in progress. When we did our Masters Degrees at the School of the Art Institute of Chicago, we were accepted as a collaborative team. Our project was called Memory Bank and was about memory and fragmentation. We envisioned a giant mirror ball, a kaleidoscope of life made up of numerous poetic documents. It was supposed to be a large dome-like structure covered with video monitors, each of them showing a looped clip. At the time, 1991 – 1993, it was a difficult technical and financial challenge and so the project evolved differently. We worked on smaller scale two-channel and three-channel video installations instead. And when I look at this installation, What We Take With Us, I cannot but see some aspects of Memory Bank resurfacing. But projects are like that, aren’t they; like Russian Dolls, nestled in each other, speaking to each other. On our way back from Australia, on that long flight back to North America, I started to write about being on the plane, about speed, about slowness, about turbulence, about the immensity of the Pacific Ocean, about the darkness of the night and the few dots of life sprinkled here and there, and about the reassuring smell of coffee floating in the cabin. These texts are now a book of poetry entitled Au large des objets perdus . It was published in October 2011 at Les Éditions Prise de Parole. In July 2012, Daniel Dugas will be starting a six-month residency in Sydney with the Café Poet Program  of the Australian Poetry.